What were the top 10 stem cell stories of the year? What were the biggest news and science headlines in the stem cell field in 2015, whether good or bad? Below are mine. What are your top 10 stem cell stories of the past year? Let us know in the comments. 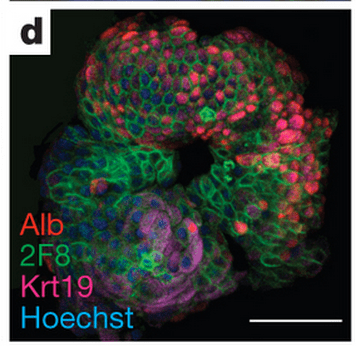 Organoids explode. Stem cell-based mini-organs (organoids) have exploded in terms of impact in the last couple years. 2015 had many examples of these super cool human organs in a dish made from stem cells. Organoid technology has huge potential for teaching us about human organ development and function as well as disease pathogenesis and treatment. I recommend this interview by Alexey with organoid pioneer Madeline Lancaster for more on this exciting trend. Clinical trials pile up. More good news. The number of real, promising stem cell clinical trials continues to build. This is fantastic and shows the continuing maturation of the stem cell/regeneration medicine/cell therapy fields. Think about where things were 5-10 years ago with stem cell clinical trials and you see how much progress has been made. Sale of CDI and Ocata to Japanese pharma. Japan continues to show leadership in commercializing stem cells and regenerative medicine, and this in part manifested in 2015 with the big-time purchases of two American stem cell biotechs by Japanese pharma companies. Does the nation of a biotech company matter in this day and age? Are pharma acquisitions of small stem cell biotech good news or bad or some combo of the two? We can expect more corporate acquisitions in the stem cell arena in the coming year. Stay tuned for my top predictions for the stem cell field in 2016. Stopping of IPS cell clinical study in Japan with broader regulatory switch there to allogeneic IPS cell focus. The pioneering macular degeneration clinical study using IPS cells in Japan was stopped this year and now a second IPS cell study (Parkinson’s Disease) there has been delayed. Regulatory changes now mandate that IPS cell clinical work be done with allogeneic cells. This change still remains somewhat of a mystery given the big potential of IPS cells on the patient-specific front using an autologous approach. We’ll hear a lot more about this in 2016. Another regulatory change in Japan is the move to allow charging of patients for clinical trial participation. I’m not a fan of this change to put it mildly. CRISPR. Of course CRISPR is not specific to stem cells, but it opens new doors to understanding stem cell biology and development, particularly in the human research sphere. The genetic research on human stem cells that has opened up because of CRISPR is very exciting. Human genetic modification on the table. Related to the above, gene editing of human pluripotent stem and germ cells has big ethical and social implications. The potential future production of genetically modified human beings via primordial germ cell or pluripotent stem cell editing raises big, thorny questions. Whether we are talking about genetic modification of somatic cells for therapy or production of actual designer babies, this topic was a hot one in 2015. For more, check out my new book, GMO Sapiens. Stem cell clinics continued to bloom. From Internet searches to patient contact, the data out there are consistent with a continued rapid growth of stem cell clinics pitching at best unapproved stem cell interventions to at worst stem cell snake oil. FDA action absent still on predatory clinics. For two years the FDA has practically speaking done nothing to address the exploding problem of stem cell clinics (see above) selling unapproved stem cell “treatments” to tens of thousands of patients in the US. We cannot forget about stem cell tourism, but the stem cell clinic problem in the US is massive and growing, and only made worse by an FDA that appears to either have mixed feelings on it or simply be moving in slow motion. Something’s got to give on this and I thought that would happen in 2015. Maybe it will in 2016. Celebrities as advertising for stem cell clinics. Also in the dubious sphere we saw in 2015 an acceleration of celebs being the top drivers of patient traffic to stem cell clinics. Gordie Howe made the biggest news, but then there was Bart Starr and many others. For every famous person who puts themselves at risk or who is put at risk by their families looking for hope from stem cells, how many ordinary people follow suit and how many people will lose precious savings and potentially be hurt? CIRM 2.0 picks up pace. Ending with some good news, the new incarnation of The California Institute for Regenerative Medicine (CIRM) as CIRM 2.0 (a name I admittedly enjoy saying as I coined the term) continued to build momentum in 2015. CIRM 2.0 has a distinctly clinical focus. The agency is picking up the pace on issuing RFAs and new funding. Where are all the new CRISPR human embryo papers? It is so interesting how much progress was made in stem cell therapy over the last year. It seems like a good thing that so many clinical trial have opened up. This means the researchers and developers can see real results. I will be looking forward to new discoveries in the coming year.